Run a comprehensive affiliate program instantly and easily. 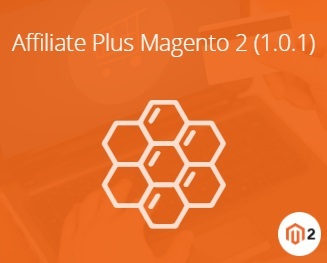 You only have to install the Affiliate Plus Magento 2 extension by Magestore. Below, we describe a standard package of the module. 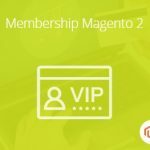 To make this Magento 2 extension even more powerful, you can also install Multiple Program Plugin that is described in a separate post. More Magento 2 affiliate extensions are available here: Magento 2 Referral And Affiliate Marketing Extensions. So, what are core features of the Magestore Affiliate Plus Magento 2 module? The extension allows you to set various requirements for commissions, discounts, and payouts. Next, it provides the ability to manage banners and links your partners will share with customers via emails or social channels. Note that there are several payment methods available with Affiliate Plus, such as Pay per sale or Paypal Masspay. Link sharing through social channels or emails for referring friends. Per sale payments for sales that occurred from shared links. Automated payments via PayPal Masspay: a payout is conducted automatically when the payment is requested. Multiple payment methods are supported: Moneybookers, PayPal, Bank transfer, Offline payment, etc. Advanced transaction management: a relevant information is available for each transaction. 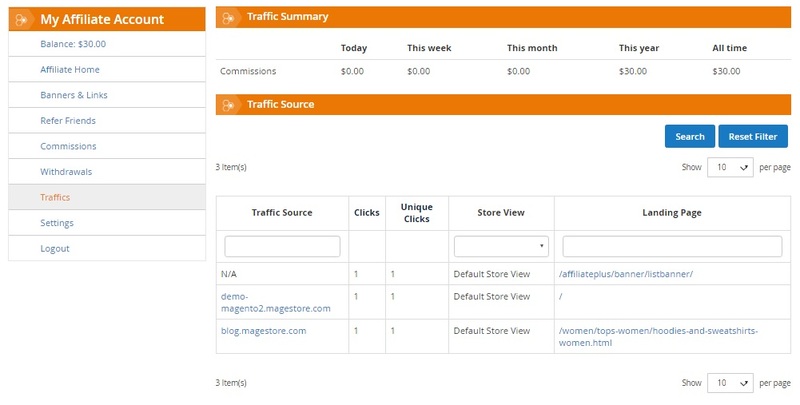 As for the admin functionality of the Magestore Affiliate Plus Magento 2 module, it allows you to fine tune commissions, discounts, and payouts, manage referrals and view information about affiliates, as well as upload banners and create text links for sharing. Besides, the extension offers withdrawal capabilities. To illustrate more details, let’s take a look at the extension’s backend. First of all, we’d like to draw your attention to the Manage Accounts page. It contains all affiliate accounts. You can export this data in a CSV, XML, or Excel format. Besides, there are two mass actions available: you can delete several accounts simultaneously or change status in bulk. Action – you can edit each account here. While creating or editing a new account, you have to deal with two tabs: General Information and Payment information. If the account already exists, there are two more tabs: History Transaction and History Withdrawal. The General Information tab allows you to change account status between enabled and disabled. Next, you should specify customer’s first and last names and email address. 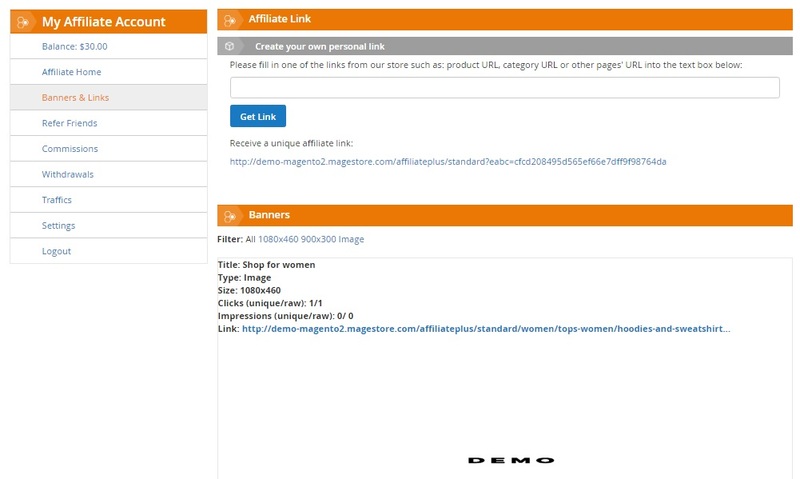 Next, the Magestore Affiliate Plus Magento 2 extension displays a link to a corresponding customer account. 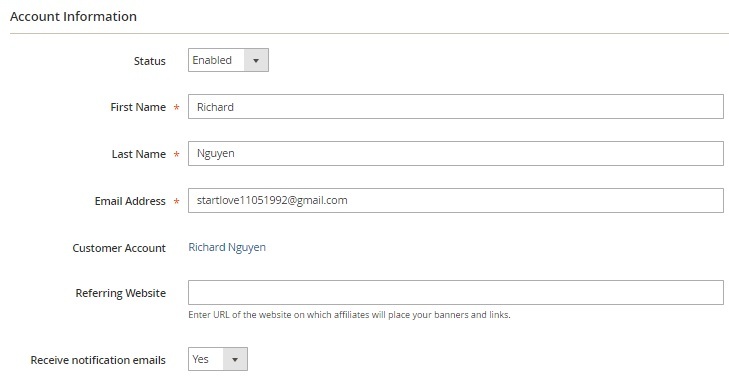 The Referring Website field allows you to place the URL of the website on which the affiliate will place your links and banners. The last option allows you to activate email notifications. Note that while adding a new account, you have to deal with a slightly modified tab. It contains the Password field (a password can be modified by the affiliate) and allows you to associate the account to a website. 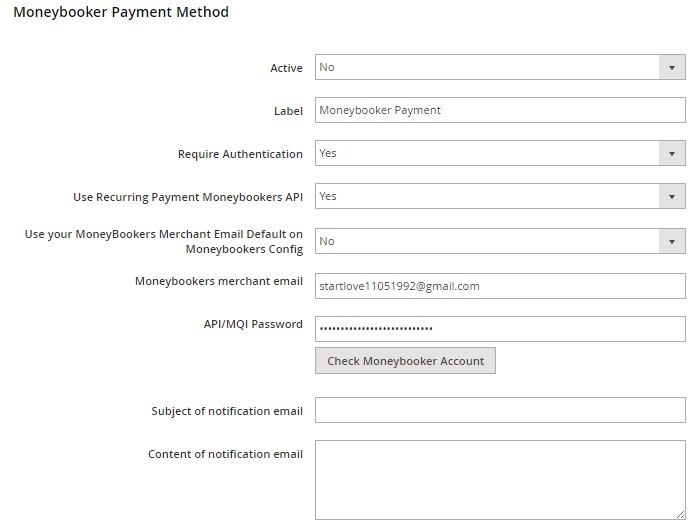 As for the Payment Information tab, it allows you to specify/edit PayPal and Moneybooker email addresses, enable/disable recurring payments, and choose a recurring payment method (PayPal or Moneybooker). In the already existing account, the following information is also available: Total Clicks, Unique Clicks, Balance, Total Commission, and Commission Paid. Note that each column contains a filter. The Manage Banner screen provides all available banners in a grid that shows banner ID, title, link, type (Image, Flash, Text), and status. You can edit each banner from the Action column. As for mass actions, they allow you to delete banners or change their status in bulk. While editing the existing banner, you can change it’s title, type, add a new source file (the preview is also available), specify width and height in pixels, add a target URL that will be used for redirection, include/exclude the rel=”nofollow” attribute to/from the link, and change status. Unique/raw clicks and impressions are also shown here. The Manage Transaction grid allows you to export the appropriate data as CSV, XML, or Excel files as well as cancel or unhold transactions in bulk. 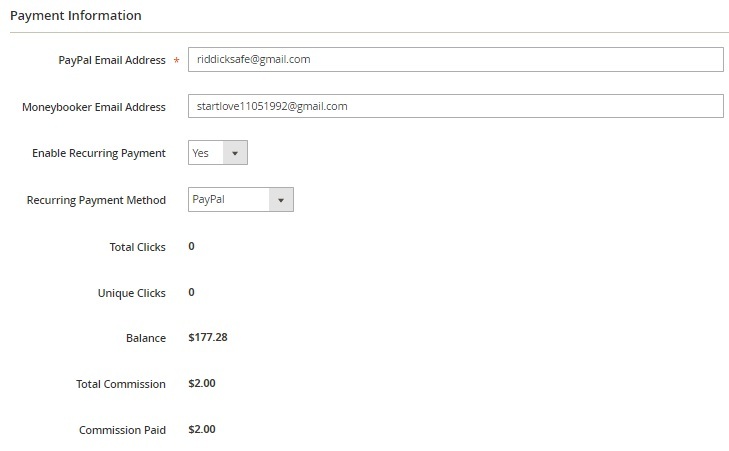 As for available columns, they are: Checkbox; ID; Product Name; Affiliate Email; Customer Email; Order ID; Order Subtotal; Commission; Discount; Date Created; Status; Store view; and Action. Note that you can apply filters to all columns except the last one. All withdrawals are available in a grid as well. This time you have to deal with 10 columns: ID, Affiliate Email, Amount, Tax Amount, Fee, Withdrawal Method, Is REcurring, Date Requested, Status, Action. You can apply filters, add new withdrawals, or edit the existing ones. While adding a new withdrawal, you should select an affiliate account. Next, choose a withdrawal amount, select a payment method, and specify a fee amount. 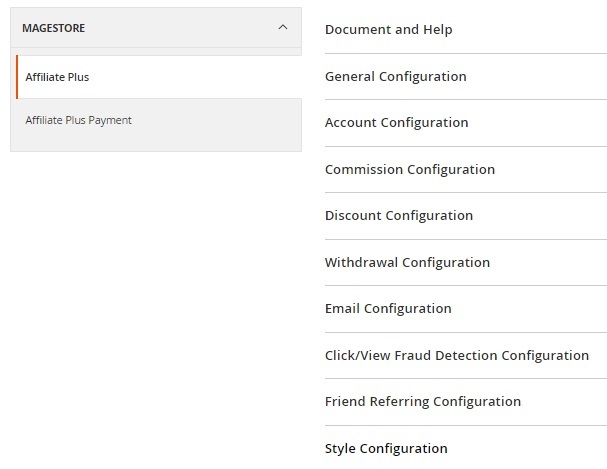 All extension settings are divided between two tabs: Affiliate Plus and Affiliate Plus Payment. In its turn the first tab is divided into 10 sections: Document and Help, General Configuration, Account Configuration, Commission Configuration, Discount Configuration, Withdrawal Configuration, Email Configuration, Click/View Fraud Detection Configuration, Friend Referring Configuration, and Style Configuration. 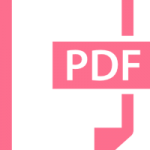 The Document and Help section provides links to three guides: Affiliate Plus Installation Guide, Affiliate Plus Plugin Installation Guide, and Affiliate Plus Standard User Guide. 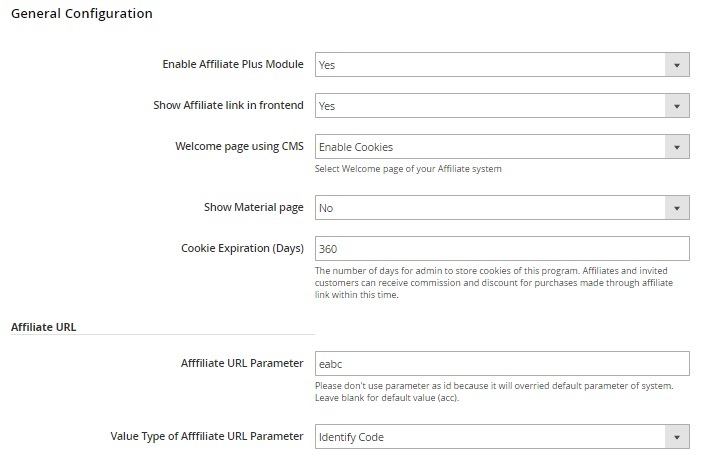 The General Configuration section provides the ability to enable the module, activate affiliate links in frontend, select a CMS page for the Welcome page, show/hide Material page, and set cookie expiration. Next, you specify the affiliate URL parameter and set its value type. 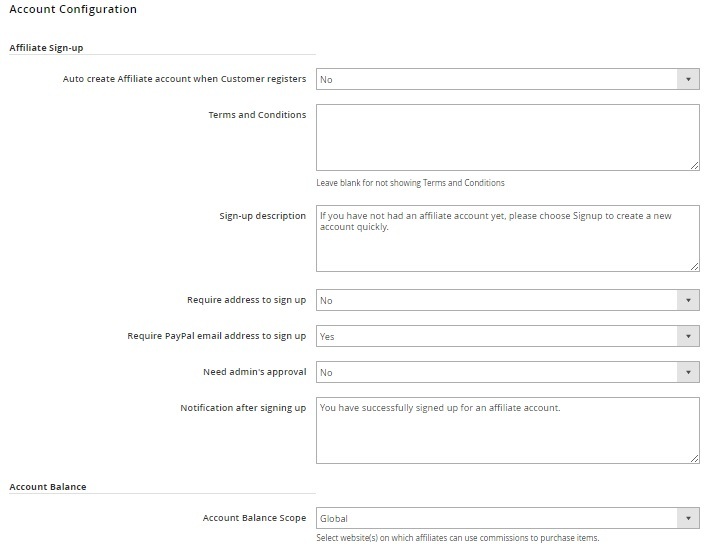 In account Configuration you can activate a feature that will automatically create affiliate accounts after customer registration. Besides, you can add terms and conditions, a sign-up description, and a notification after signing up here. And enable/disable the following features: Require address to sign up, Require PayPal email address to sign up, and Need admin’s approval. 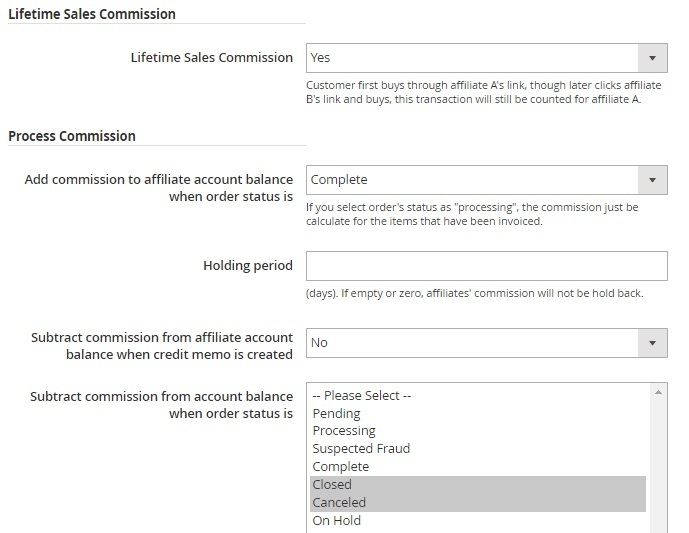 In Account Balance Scope, choose website(s) on which affiliates can use commissions to buy items. In Comission configuration, there are three subsections. In Pay per Sales/ Profit Commission you choose a payment commission type (per sale or per profit). Next, you decide whether it is a fixed amount, a percentage, or a fixed amount for the whole cart. Note that you can use different commission from the 2nd customer order: specify its type and value. Next, you can activate/deactivate lifetime sales commission and configure commission processing. Choose order status to add commission to the affiliate account balance, choose holding period, decide whether to subtract commission from affiliate account balance when credit memo is created or not, and choose order status for subtracting commission. In Discount Configuration decide what to do with the affiliate program discount when there’s a shopping cart discount, choose a discount type and value, enable/disable separate discount from the second customer order, and choose where to display the discount (shopping catr page or product page). 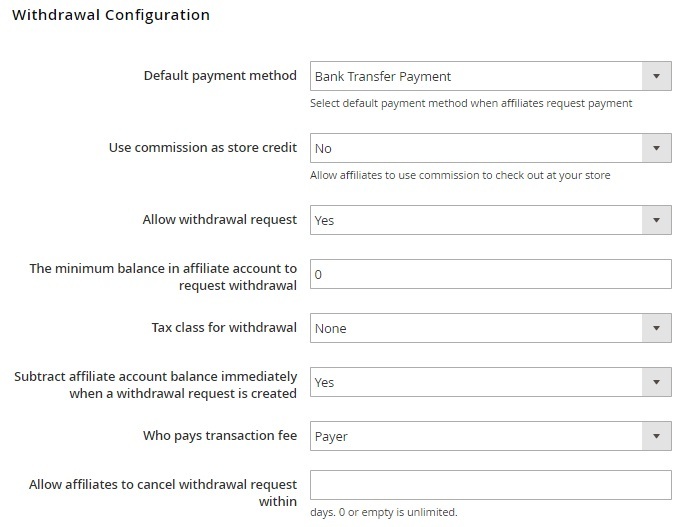 In Withdrawal Configuration, select default payment method when affiliates request payment (offline payment or bank transfer), enable/disable using commission as store credit, allow withdrawal request, specify a minimum affiliate account balance to request withdrawal, choose a withdrawal tax class, decide whether to subtract affiliate account balance right after a withdrawal request is created or not, specify who pay transaction fees (recipient or payer), and choose a period when affiliate can cancel withdrawals. In Email Configuration, set sender name and email. Next, you can activate and customize email notifications for various occasions. 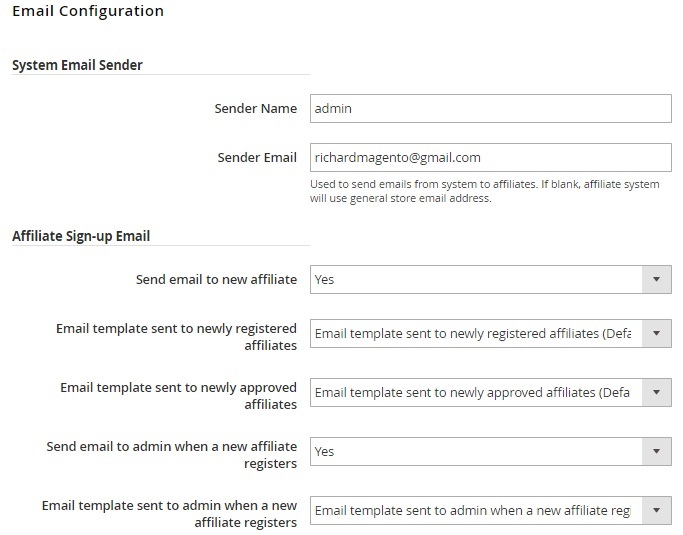 Choose templates and decide whether to send messages to both affiliates and admins. 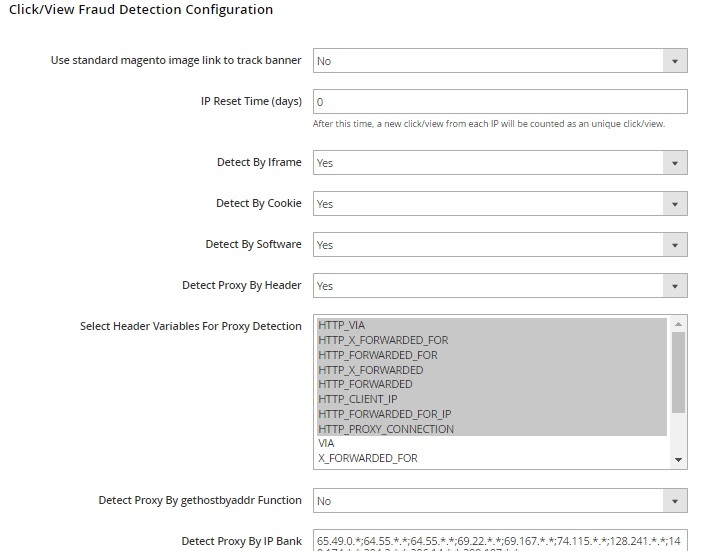 In Click/ View Fraud Detection Configuration, you can activate the usage of a standard Magento image link to track banners, set IP reset time, detect frauds by iframe, cookie, and software as well as detect proxy by header, selecting header variables, gethostbyaddr Function, or IP bank. The Friend Referring Configuration is divided into 3 subsections: Refer Friends Link, Refer Friends Page, and Social Configuration. 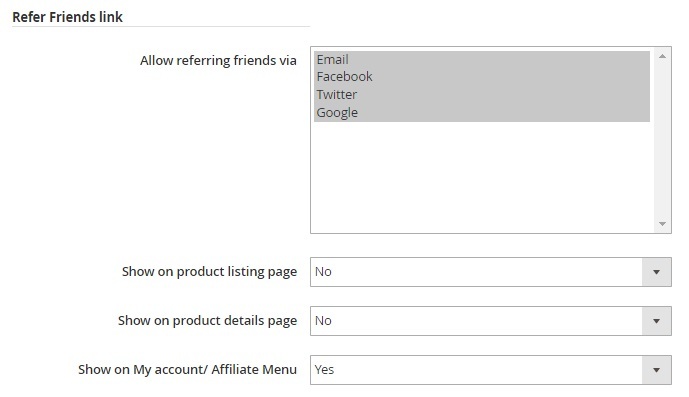 The first subsection allows you to activate friends referring by Email, Facebook, Twitter, and Google as well as decide where to show links: on product listing pages, product details pages, and My account/ Affiliate Menu. 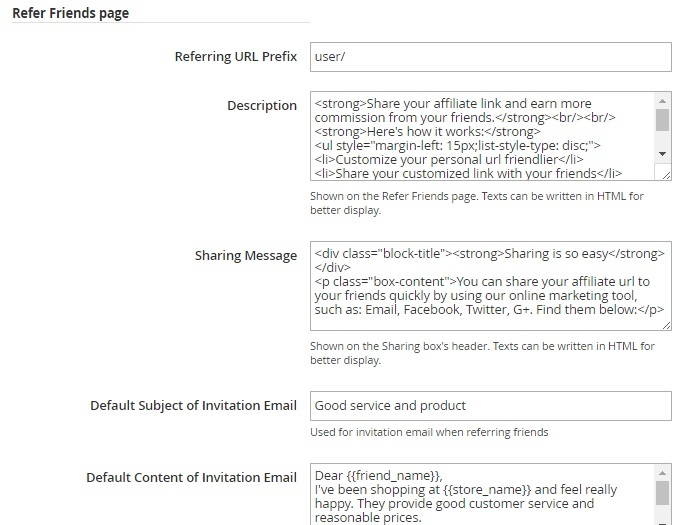 Refer Friends page allows you to specify a referring URL prefix, add a description and a sharing message (you can use HTML in both), specify a default subject of the invitation email, and add its default content (you can use variables). 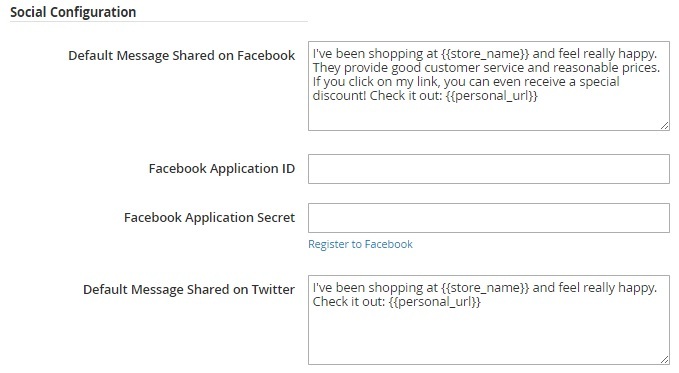 As for the Social Configuration subsection, you can add default message shared on Facebook and Twitter (with variables) as well as specify Facebook Application ID and Secret. 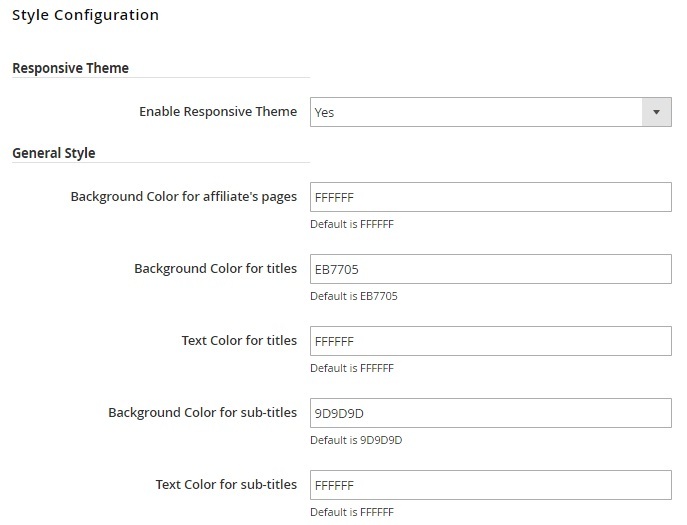 In Style Configuration, you enable/disable responsive theme and set colours for texts, backgrounds, and other elements. 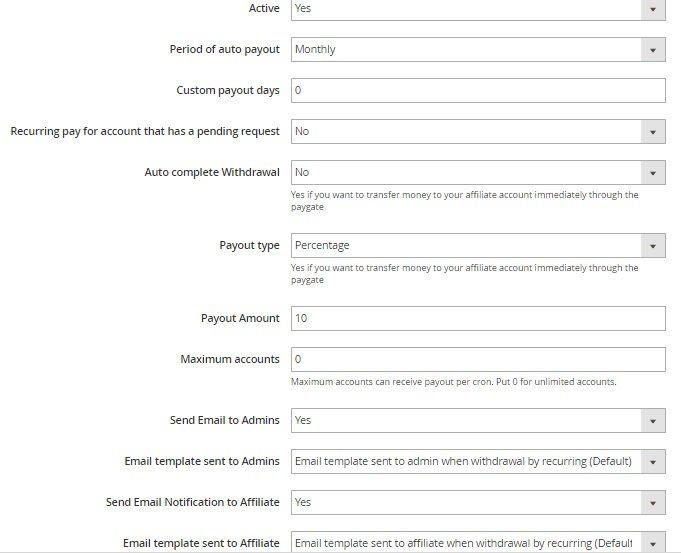 The affiliate Plus Payment tab is divided into 5 sections: Recurring Payment Configuration, Offline Payment Method, Bank Transfer Payment Method, PayPal Payment Method, and Moneybooker Payment Method. 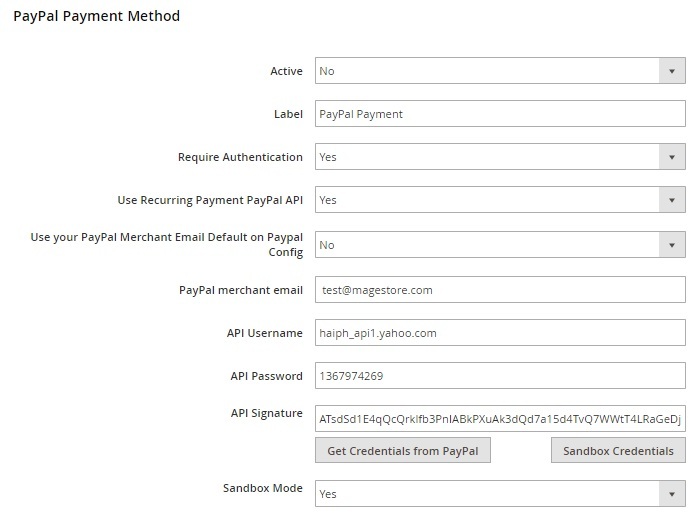 In the first section, you activate recurring payment, choose a period of auto payout, set custom payout days, enable/disable recurring payment for accounts with pending requests, activate withdrawal autocomplete, choose payout type and amount, specify a maximum number of accounts that can receive payout per cron, as well as activate and configure email notifications to admins and affiliates. 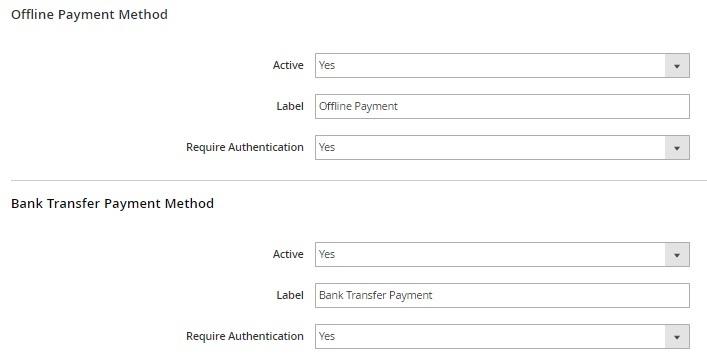 In the Offline Payment Method section, you activate this payment type, specify its label, and enable/disable authentication. The same is about bank transfer payment method. 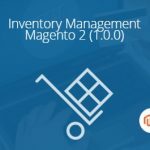 From the affiliate’s view, the Magestore Affiliate Plus Magento 2 extension also provides a lot of opportunities. The affiliate account contains 8 tabs: Balance, Affiliate Home, Banners & Links, Refer Friends, Commission, Withdrawal, Traffics, and Settings. Besides, you can logout. In the Balance tab, you can request withdrawal. 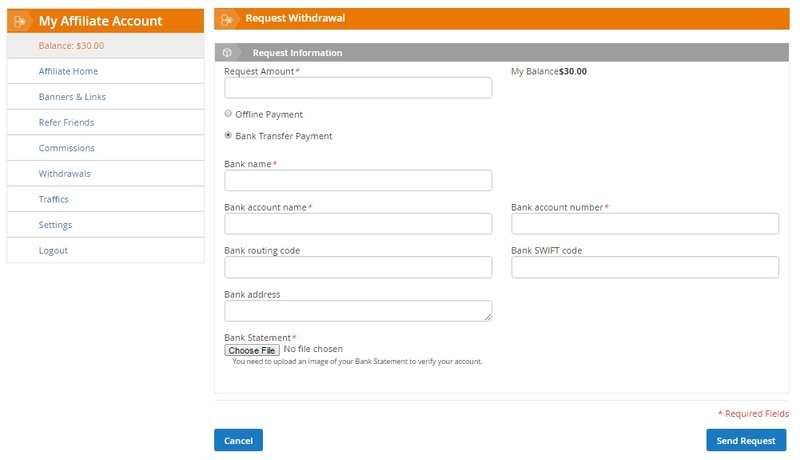 Set a request amount and choose a payment method: Offline Payment or Bank Transfer Payment. 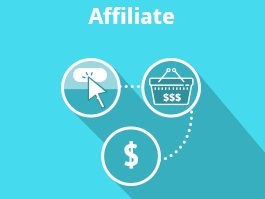 The Affiliate Home tab describes the available program. It displays a current commission type, payment requirements, and discount policy. 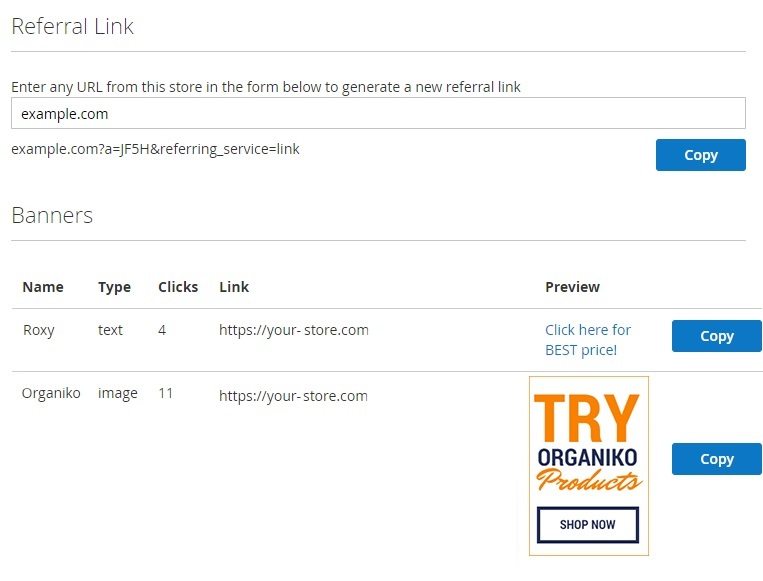 In Banners & Links, you can create affiliate links by placing the already existing store links. Besides, there is a banner code available here. The Refer Friends section provides the ability to share your affiliate link via email, Facebook, Twitter, or Google+ to earn commission from your friends’ purchases. In Traffics, you can check traffic summary and traffic sources (all clicks are listed here). In settings, you can change your first and last names, select a new address, specify a PayPal email, add a referring website, change password, and activate email notifications. 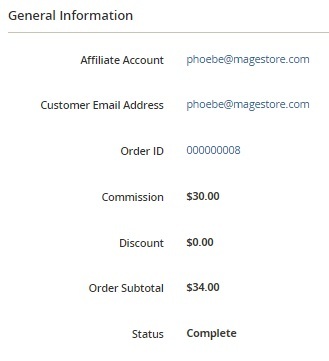 As you can see, Magestore Affiliate Plus Magento 2 extension is a complex system designed to create a reliable affiliate system on the basis of a Magento 2 website. If you are looking for a robust affiliate solution, don’t hesitate to give it a try, especially because the module costs only $199. 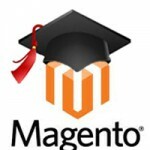 Its Magento 1 predecessor can be purchased for just $99.